This school is the cornerstone of our racing programs (no prior experience necessary). Our course is crammed with intensive training on how to drive a racecar at the limit. No rev-limits are ever imposed, passing is allowed from the moment you strap into the racecar, all complete laps (NO stop boxes), and there is no crash damage liability. We provide you with the equipment and instruction required to progress safely at your own pace. 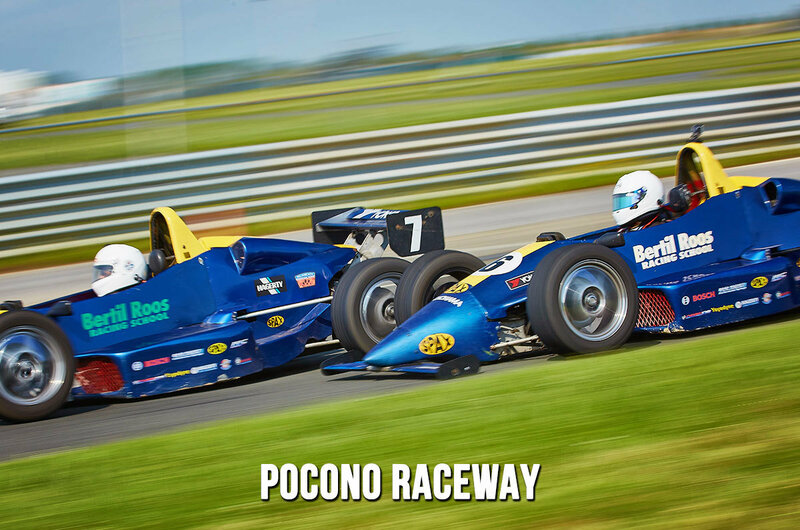 Different from our Half and 1-Day racing adventures, our racing school’s emphasis is on teaching and training you how to be a better, faster racecar driver. Day one starts with a brief classroom session, followed immediately by a track session in one of our patented slide cars. Then, some trackside demonstrations by the instructors, followed by an additional classroom session and on-track practice with one of our street cars. After a short introduction to the racecars, safety equipment, safety flags, and a short discussion about racing etiquette, we finish the day with two track sessions in the racecars. Day two begins with another brief classroom session, followed by another session in the slide cars and street cars. This track session’s objective is to ingrain every bump, wrinkle, and visible marker into your racing mindset. Four additional track sessions in the racecars and a track walk add to your knowledge gained the previous day, applying theory to the real world. You will be given an abundant amount of seat time, practicing and perfecting the skills required to advance to the final day. Day three. You’ve trained forty-eight hours for this day. Time to apply your new-found skills and acquire the additional advanced techniques required to devour the track and squeeze every last tenth of a second out of yourself. A slide car session is combined with FIVE track sessions in the racecars, working on those little nuances that trim the last few tenths off your lap times. You will learn the techniques that made our school famous, and to this day, set us apart from the competition. You will practice techniques such as: Ocular Driving, the Auto Pilot, Rotational Turn-In, Line Recovery, Slide Control, Heel and Toe, and Creative Visualization.